A two-page spread from Sotheby’s oversize newsprint publication, a rich pictorial scrapbook. Photograph by Edo Bertoglio from the set of the film Downtown ’81. Sotheby’s catalogue for Jean-Michel Basquiat’s “Untitled (1982),” at auction this week. A request from Sotheby’s recently alerted Gallery 98 to the full slate of Basquiat auctions taking place in New York this week. To promote their star piece, an untitled 1982 canvas estimated at $60 million, the auction house was assembling an oversized newspaper catalogue, using content from Gallery 98 and many other sources to situate Basquiat’s career amid the Downtown art boom’s defining locations (the Times Square Show, “New York/New Wave” at P.S. 1, the Mudd Club, Fashion Moda, ABC No Rio) and personalities (Keith Haring, Andy Warhol, Rammellzee). The 1982 canvas turns out to be only the tip of the iceberg. Eric Fretz of Basquiat Biography has pointed out that Sotheby’s will be auctioning a total of eight Basquiat pieces in the next two days, which, added to the nine currently at Christie’s (for auctions today and tomorrow) and ten at Philip’s (for auctions today and tomorrow), makes for 27 Basquiat works currently at New York’s auction houses. As great Basquiat fans, we’re hoping that these treasures all find great homes. 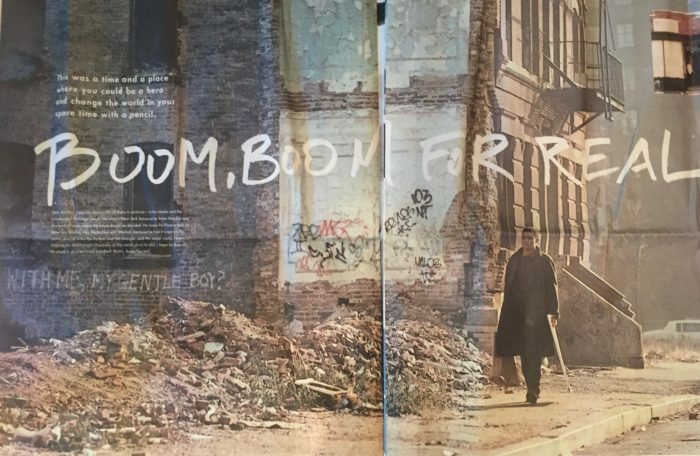 One image from Gallery 98 in the Sotheby’s catalogue is the promotional card for ART/new york’s 1984 video documentary “Graffiti/Post-Graffiti,” produced by Paul Tschinkel, and featuring an interview of Basquiat by Marc H. Miller. 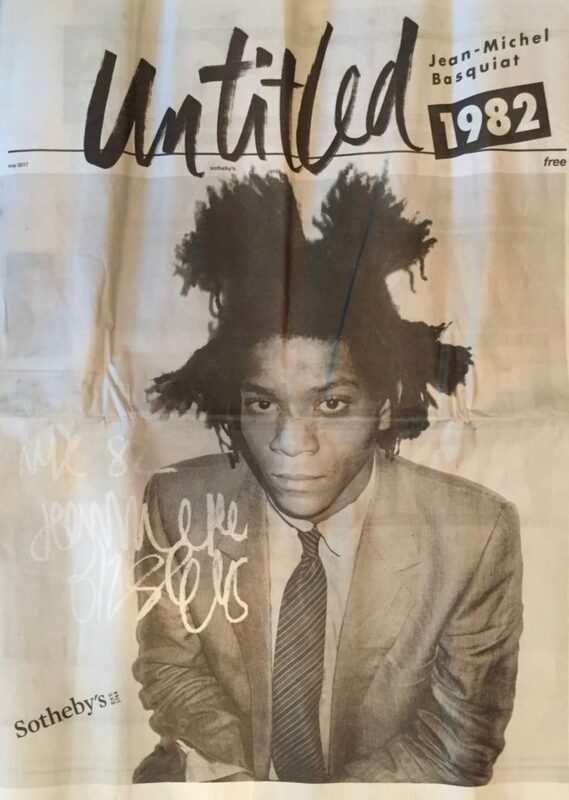 At the 98 Bowery website, you can find extended excerpts of the Basquiat interview (taped during his 1983 FUN Gallery exhibition), as well as background information on the controversial interview and the ART/new york series. 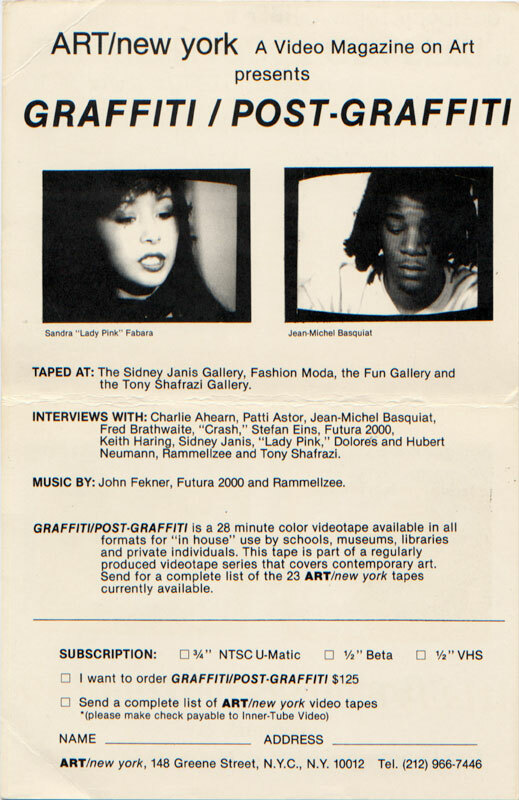 Promotional card for ART/new york‘s video documentary “Graffiti / Post-Graffiti,” 1984.